Every night she does this. Ever since she moved into my room. Jessie won’t go to sleep. She throws her pillow on the floor, she stands at the bar of her cot, and she screams. Her big sister can’t sleep either – she wishes Jessie would be quiet, or, better still, that Jessie wasn’t sharing her room at all. It seems nothing will settle Jessie down to sleep, except maybe a little bit of sisterly love. Go to Sleep, Jessie! is a gorgeous tale of a situation many families will relate to,from one of Australia’s favourite picture book pairings. Libby Gleeson’s text tells a fairly simple tale of a baby who won’t sleep in spite of big sister, Mum and Dad’s efforts, but at the same time there’s a deeper tale, of both sibling rivalry and sibling love. Apart from not being able to sleep, the big sister also laments the loss of her own space, and the disruption that Jessie has brought to her life. When Mum tells her she doesn’t really want her own room, big sister disagrees – but when Dad takes Jessie out for a drive to try to settle her, big sister can’t sleep, and it is her sisterly intervention which finally gets Jessie to sleep and helps her sleep, too. Freya Blackwood’s illustrations, in watercolour, gouache and pencil, perfectly capture both the frustration and the mixed emotions of the big sister, as well as Jessie’s upset. WHile Mum and Dad are art of the story, Blackwood makes sure the children are central – with Mum and Dad only visible either from behind or from angles which don’t show their faces. This is the children’s story, and the final image of them asleep together in Jessie’s cot is gorgeous. Cleo is about to say that she got her T-shirt for Christmas and the whole family came, even Uncle Tom from America, and now he’s going to stay here. They all went to the beach for dinner and a swim. She is suddenly quiet. Maybe the other girls will think a T-shirt is not such a great present, not like a necklace. She touches her bare neck. What would a necklace feel like? Cleo is excited about her friend Nick’s birthday party. But she is wearing her Christmas T-shirt, even though it’s not Christmas, and the other girls are wearing necklaces. Cleo is sure that she has to get a necklace too – even though Mum and Dad say special presents are only for birthdays or Christmas. Cleo’s solution, when it comes, is typical of her unique way of thinking. When Mum’s birthday approaches, Cleo is determined to give her something only from Cleo, but she doesn’t have much money, and she doesn’t have a single idea. Mum says she doesn’t need a present – Cleo is everything she needs. Again, Cleo’s solution is unique, and very special. 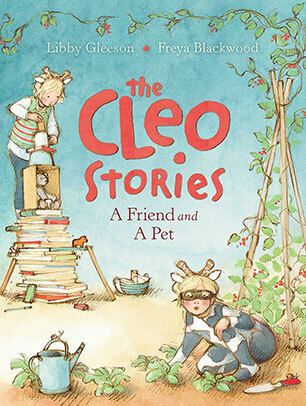 The Cleo Stories are two delightful stories of a delightful girl in one delightful hardcover volume. Cleo is an individual – she wears what she wants, and she does what she wants – but she has a big heart and a ton of imagination. Young readers will giggle at her antics just as they’ll cheer her on when she fixes her problems with innovative ideas. The two stories are told in simple text, accessible to early readers, without feeling simplistic. The illustrations are filled with the warm, whimsical detail fans of Freya Blackwood love so much, with end papers depicting Cleo’s neighbourhood a special treat. A book to be treasured. 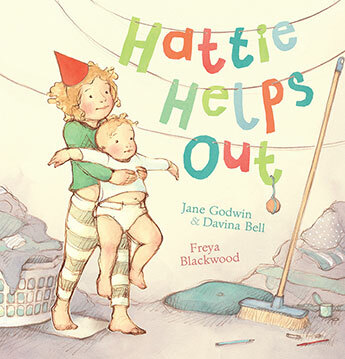 This is a picture book with a difference – and what a wonderful difference it is. Rather than containing a storyline, it contains several stories, each rendered in a double page spread, with or without a quote , all around the theme of the bicycle. In a perfect world, this book would not exist. But we do not live in a perfect world. Even if we all learn to live in peace, there will still be millions of people who need our help. This is a picture book with a difference – and what a wonderful difference it is. Rather than containing a storyline, it contains several stories, each rendered in a double page spread, with or without a quote , all around the theme of the bicycle. Created as an inspirational fundraiser for the Save the Children fund, the book explores all aspects of the magic of the bicycle, chosen as the central motif because it symbolises fun and adventure for children. Contributing artists, including Quentin Blake, Shaun Tan and Freya Blackwood have each created a double page spread, each in their own style. Some are whimsical , such as David Miller’s wonderful paper sculpture of an elephant riding a unicycle, others more serious, such as Jan Bowman’s night scene where two cyclists ride through the darkened streets of London, their bike lights illuminating their way. Some have no words, others a quote from literature or famous figures, and others quotes from children whose lives have been made better through the donation of bicycles, such as 14 year old Dany from Cambodia who says: I promise to study harder and take good care of my bicycle as my best friend. We will go to the upper grade together. Introductory notes from author/illustrator Colin Thompson and from Suzanne Dvorak, CEP of Save the Children Australia explain the concept of the book and the important work that the fund does. The Bicycle is a celebration of the bicycle, and of the wonderful impact of acts of charity. When Lucy’s mum gives her her last hug, Lucy sets out to share it with everyone in the family. Daddy give sit back, a little bit stronger. The twins vie it back, a little reluctantly, but twice as big as before. Baby Lily gives it back all peanut buttery. But when Lucy hugs the family dog, Annie, Annie runs away without returning the hug. Lucy is devastated. How will she tell Mum that she lost the last hug? Luckily, though, Annie is not a bad dog – just energetic, and eventually she finds Lucy and gives her a slobbery hug, just in time for bedtime. The Runaway Hug is a gorgeous picture book from two of Australia’s finest picture book creators, Nick Bland and Freya Blackwood. Bland’s story is strong, yet gentle and is well complemented by Blackwood’s watercolour and pencil illustrations. The family and their home are a lovely mix of whimsy and the kind of chaos that comes with big, loving families. The Runaway Hug is a warm tale of love and laughter. There was once this girl and her name was Siobhan. She lived in a big house in Dublin with her father. It was a great house, full of interesting rooms and corners, full of old magazines and old machines and old, old toys and teddy bears. Siobhan spent hours and hours exploring the rooms and halls, and she always found something new. She loved the house. Siobhan’s mother died when she was small. Siobhan can remember all sorts of things about her mother. She can remember her mother’s hands, her voice, her words. But no matter how she tries, Siobhan cannot remember her mother’s face. She’d ask her father but he’s too sad. She carries her sadness deep within her, and no one else notices. One day a woman tells her how to remember. She also has a message for Siobhan’s father. Siobhan races home and does as the woman suggests, but for a long time, forgets the message for her father. The illustrations are soft and gentle, in pencil and colour wash. Her Mother’s Face is a gentle story about loss and remembering. Siobhan, the main character is sad about her mother’s absence but she manages to survive and function normally. Her father appears to have locked his grief deep inside and part of that means removing all the photographs of his wife. People work through their grief in all manner of ways and in their own time. The illustrations are full of emotion eg the opening where Siobhan is looking through her mother’s things. Siobhan is coloured as are many of her mother’s belongings, but the image fades to sepia where her father sits, alone and silent, in the next room. There are clues for the reader about the identity of the mystery lady who speaks to Siobhan. Her Mother’s Face is long for a picture book but all the words belong. It is a lovely and loving story that may be useful in discussing loss, grief and acceptance. Recommended for mid-primary readers and beyond.